Herbacin USA: Acne Myths, Busted! There’s a lot of information about there about acne. Unfortunately, not all of it is accurate, and some if it is even harmful. In fact, following bad advice can actually make your breakouts worse. That’s why today on the blog we’re separating acne fact from acne fiction. Keep reading to learn the truth about breakouts and how to treat acne effectively. It’s true that acne is linked to hormones. During adolescence, our hormone levels are at their peak, which is why acne is so common in teenagers. Unfortunately, acne doesn’t just magically disappear on your 20th birthday. In fact, 40 to 55% of people between the ages of 20 and 40 experience acne breakouts, according to the International Dermal Institute. So if you’re over the age of 20 and still have acne, you’re certainly not alone! Acne is caused by bacteria, so it makes sense that getting your skin squeaky clean will clear up breakouts, right? Unfortunately, many people with acne actually overwash their face by using harsh cleansers and scrubbing too hard. This can actually make acne worse because it signals the skin to create more oil. As a result, skin breaks out even more! Instead, use a gentle cleanser twice daily. If you wear makeup, make sure to remove it fully by using an oil-based makeup remover like our 2-Phase Makeup Remover, since makeup residue can cause overnight breakouts. As we mentioned above, dry skin produces more acne-causing oil. 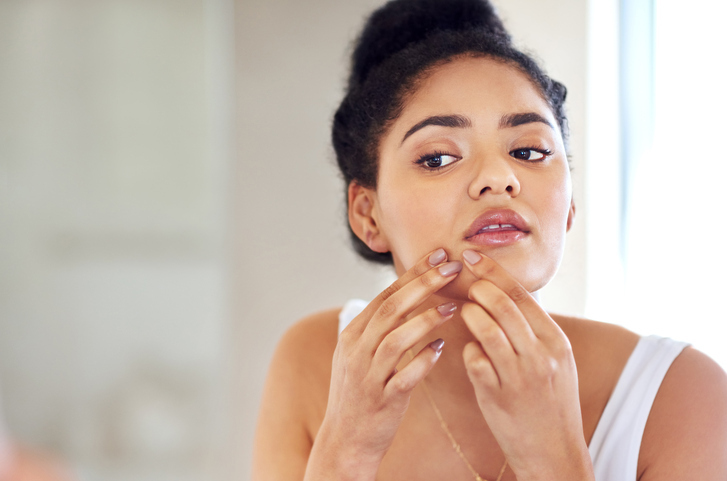 While it might seem counterintuitive to moisturize your skin if you have an oily or acne skin type, it will actually help to hydrate your skin and regulate sebum production. Just be sure to use a lightweight moisturizer rather than a heavy cream to avoid clogging pores. Sunlight can kill acne-causing bacteria and a tan can camouflage zits. However, tanning also worsens hyperpigmentation. Translation? If you get dark scars from your pimples, exposure to sunlight will only make these scars more noticeable. Plus, tanning can lead to premature aging and skin cancer down the road. While that might seem like the least of your worries now, your future self will thank you for staying out of the sun. Chocoholics, rejoice! There’s no direct link between eating chocolate and acne breakouts. However, foods that contain hormones, like milk and cheese, can make acne worse. So if you’re acne-prone, trying cutting dairy out of your diet to see if helps improve your breakouts. Also, eating a healthy diet with plenty of lean protein and leafy vegetables will improve your skin from the inside-out. Not sure what to eat? Here’s our recommendations on foods for glowing skin – and which to avoid. While there’s definitely something satisfying about popping a zit, doing so usually only makes things worse. Popping a zit can introduce more bacteria into the skin and lead to infection. Plus, the trauma of popping can make scarring much, much worse. The best thing you can do is to leave your zits alone and wait for them to heal on their own. Do you have any acne myths that we haven’t included? Let us know in the comments!